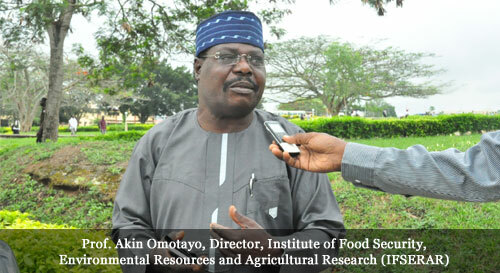 The Director, Institute of Food Security, Environmental Resources and Agricultural Research (IFSERAR), Federal University of Agriculture, Abeokuta (FUNAAB), Professor Akin Omotayo has called on the Federal Government to ban the importation of rice into the country. 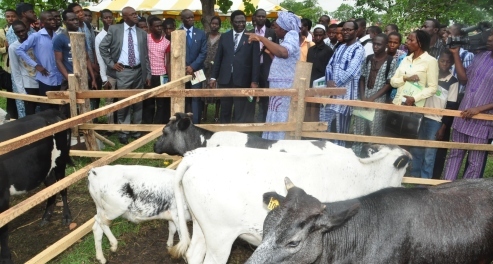 The Director, who is also a Professor in the Department of Agricultural Extension and Rural Development of the University made this call recently while featuring on an interview programme on Radio, observed that agriculture, which had been the main stay and a major source of income for the country in the early 1960s had not been given due attention since the discovery of oil. “There is a decline in interest of youth in Agriculture programmes, which means that old age people are more into farming activities. For instance, income realized from sales of produce such as maize after cultivating for three months is not commensurable to what a youth would realize when working for an oil company”, he stated. “Every year, the country is divided into zones where meetings are held at the International Institute of Tropical Agriculture, Ibadan, to discuss on pre-planting and post-planting activities but implementation of the various policies is a major problem”, he added. Professor Omotayo stated that planning was really not our problem in Nigeria but lack of proper implementation of already formulated public policies. “We need to put in place all that we have and any country that wants to develop must first be prepared to suffer for a while and endure. Moreover, all our borders to neighbouring countries must be closed and we can then mobilize the people to engage in rice production. Also, government must ensure that there is adequate supply of raw materials to people in the rice producing areas such as Ewekoro and Ofada in Ogun State, Abakaliki in Ebonyi State and Kwara State. 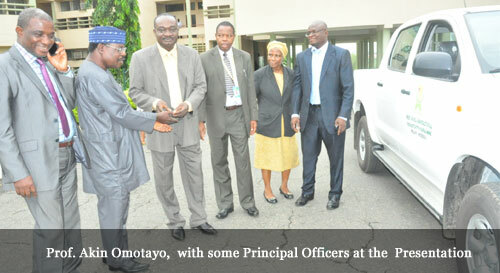 About N356 million was spent on importation of rice in year 2013. Necessary structures that will enable Nigeria to have minimum requirement must be put in place. In addition, the ‘force men’ at our borders must be well-equipped in order to combat smuggling because importation does not encourage local production”, he maintained. In another development, Professor Akin Omotayo had charged Scientists and Researchers to participate more in competitive research grants in order to increase their chances of winning good international grants. Professor Omotayo, who is also the winner West Africa Agricultural Productivity Programme (WAAP) grant, gave this charge during the presentation of the WAAP project vehicle to him, to facilitate the implementation of the project. According to Professor Omotayo, a lot of grant opportunities were available across the globe and when explored, could bring development to the University and country at large, as he called on young scientists to work hard, to win such grants. He disclosed that scientists could partner with the University’s Directorate of Grants Management, to identify available research grant opportunities, stressing that he would be willing to give them appropriate mentoring. Professor Omotayo added that the project was aimed at increasing productivity across West African nations and was already actively running in Nigeria, Ghana, Sierra Leone, Cote d’ivoire and Burkina Faso, for the next two years in the area of Aquaculture. “We are multiplying fingerlings for WAAP, to be distributed to farmers across the country. We are to produce eight million fingerlings and we are also partnering with WAAP, to multiply yellow-flesh cassava for distribution to farmers not just in South West alone but throughout the country”, he stated. The Vice-Chancellor, Professor Olusola Oyewole, who was represented at the occasion by the Deputy Vice-Chancellor (Development), Professor Felix Salako, congratulated Professor Omotayo and Dr. Adeola Abiodun, for winning the WAAP grants. It would be recalled that Dr. Abiodun Adeola’s project proposal entitled “Improving Child Nutrition in Nigeria Using Yellow Fleshed Cassava/Sorghum-based Complementary Food” was tentatively approved for funding alongside Professor Omotayo’s project titled “Adaptation and Promotion of Extra Early Maize (Zea mays L) Varieties to Mitigate the Effects of Climate Change in South Western Nigeria”.